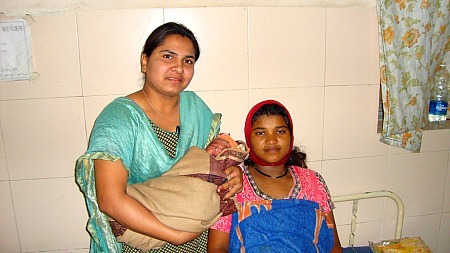 Nurse Archana Kale (left) holds the newborn son of Maya Vikas Jadhav (right). Kale helped resuscitate the baby boy after his birth. The 24-year-old was the only nurse on duty that memorable night. Maya Vikas Jadhav, pregnant with her first child, had been in prolonged labor most of the evening. Anxious relatives waited outside the labor room at Sub-district Hospital, Bhor, Pune district. Recalling her training just hours before, Kale calmly took action. She positioned the baby to begin extracting mucus from his mouth and nose. After that task, she began stimulating the baby by rubbing his back and flicking the soles of his feet. He took a breath. Kale said Maya’s family thanked her profusely for the care she gave to their newest relative. Every year an estimated 4 million newborns die during their first month of life. Half of these deaths occur during delivery and the following 24 hours, often as a result of lack of oxygen. Many babies with breathing complications can be saved if they receive the appropriate care during the first minute of life. Kale is one of 117 providers at 13 health facilities in the state of Maharashtra who, since November of 2012, have received specialized training on quality labor, childbirth and postpartum care, thanks to support from the MacArthur Foundation. Through this program, Jhpiego, in collaboration with the Government of India and state health officials, has simplified health standards and tools that give nurses and other providers a step-by-step roadmap to deliver quality care to mothers and newborns. Kale credits the newborn resuscitation training she received from Jhpiego with bolstering her confidence.